The Oilers roster is a work in progress and we will see some more changes tonight versus the first place Montreal Canadiens. 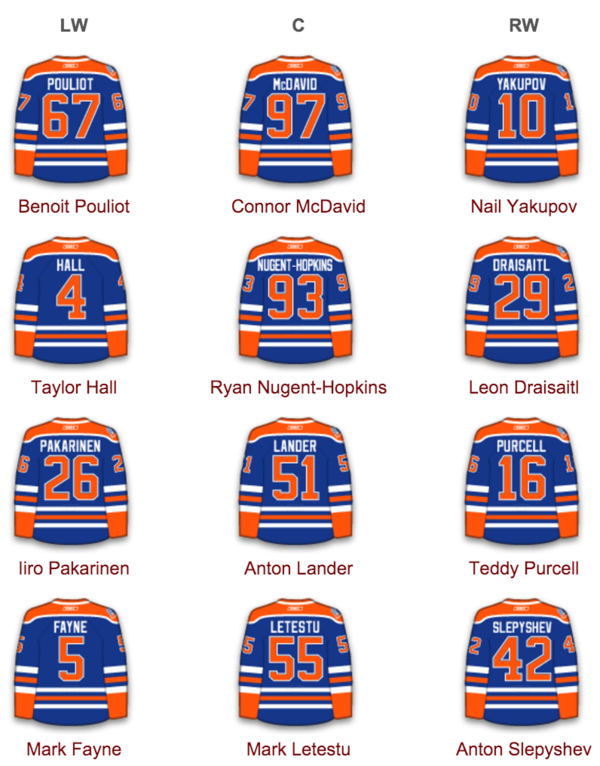 Leon Draisaitl was recalled and he will play the right wing beside Ryan Nugent-Hopkins and Taylor Hall. Last night the Oilers recalled Tyler Pitlick and Joey Laleggia, but those moves were done to get the Oilers closer to the cap, which would give them more relief when they put Jordan Eberle on LTIR today, retroactive to the start of the season. This morning, they reassigned Laleggia and Pitlick to Bakersfield and recalled Draisailt. 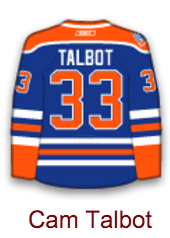 Before they recalled Draisaitl they put Eberle on LTIR. The closer a team is to to being capped out BEFORE using LTIR, the more they can exceed the cap by. So the Oilers recalled Pitlick and Laleggia to get closer to the ceiling, and then put Eberle on LTIR. The Oilers could not recall Draisaitl before putting Eberle on LTIR because they didn’t have enough cap space. The Oilers are already at the $5.5 million bonus overages on contracts due to Connor McDavid, Oscar Klefbom, Griffiin Reinhart, Darnell Nurse and Anton Slepyshev, and so while Draisaitl’s base is $925,000, he also has potential $2.475 in bonuses, so due to the Oilers already maxing out their bonus overages, Draisaitl’s cap hit is $3.4 million. Next year the Oilers overages will be even worse, because we assume all of those players will start the season in Edmonton, but with Nikita Nikitin, Ben Scrivens and Teddy Purcell’s $11.3 million off the books they should be okay cap wise. Eberle has not suffered a setback. He has already missed ten games, so he can come off LTIR the moment he is ready to play, which is likely still a week away, and possibly longer. Injuries and sub par play have led to some other changes. 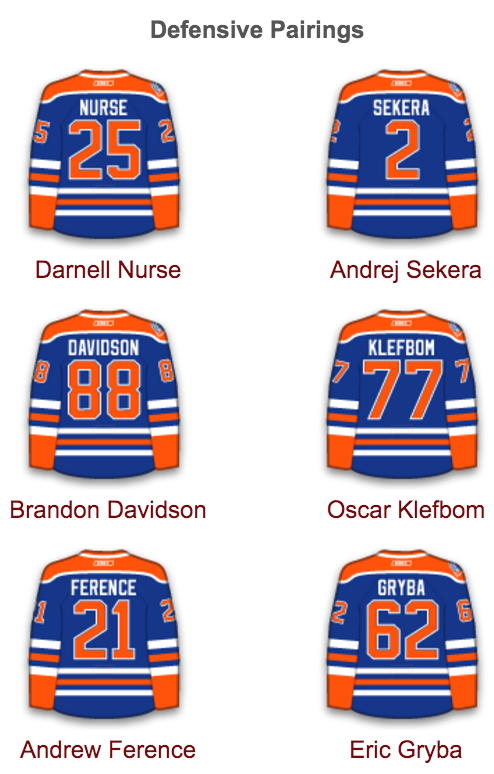 For the first time this season the Oilers will dress seven D-men. Reinhart will not play, and Mark Fayne was paired with Reinhart in practice so it would seem he is the seventh D-man. I even prematurely tweeted Fayne was scratched because the other six D had left the ice and he was skating with Reinhart. Fayne stayed out a bit longer, but then came off and he was unsure if he was playing. McLellan isn’t afraid to make tough calls or have players on their toes. I think that is a good thing. Too many players have been too comfortable in previous years, and it is good to have competition and know that if you play poorly you could sit. I know Fayne has struggled, but I’d still have him slotted ahead of Davidson and Ference, so I’ll be curious to see if he indeed is the one playing the fewest minutes. Davdison did play his best game of the season in Minnesota, but I’m still not sold he is an everyday blueliner. Lauri Korpikoski did not skate — he isn’t feeling right after the Matt Dumba hit — so Iiro Pakarinen will skate on the third line. Rob Klinkhamer is also banged up and Todd McLellan said he still isn’t sure how long he will be out. He said Klinkhamer is day-to-day for now, but will need to be re-evaluated. In the crazy stat of the day: The Oilers have owned Carey Price. He is 1-6 in career vs. Oilers with a 3.71 GAA and .857sv%. He is even worse when he plays them in Edmonton, where he is 0-3 with a 4.33 GAA and .821sv%. 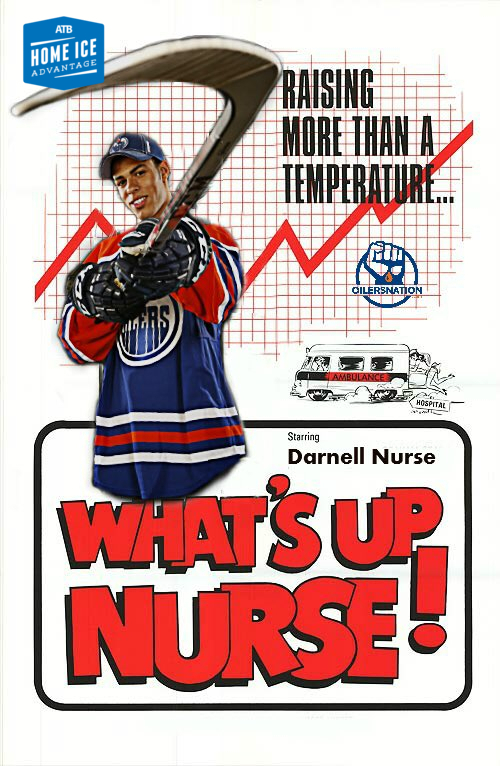 The Oilers have scored 13 goals on 73 shots versus Price at Rexall Place. Crazy. Michel Therrien told the media Price was scheduled to play here prior to start of road trip, and based on his overall career, it makes sense to start him. In the past, Price mentioned the lighting at Rexall, and if he thinks it is an issue, that is a benefit for the Oilers. Connor McDavid leads the Oilers in scoring with ten points. 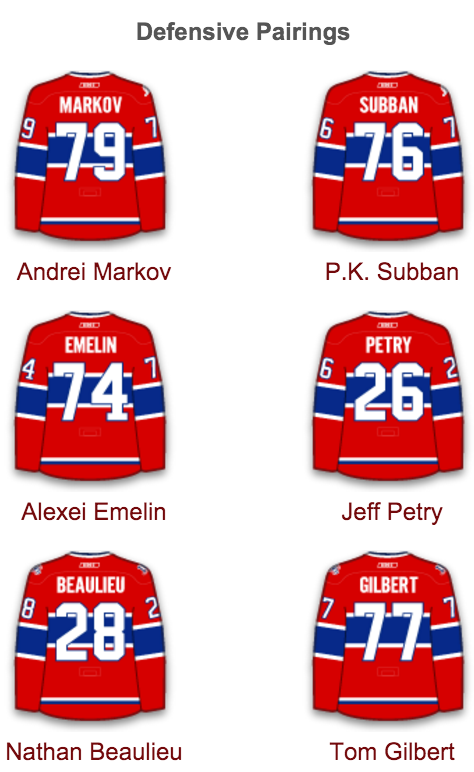 Max Pacioretty leads the Habs with 11, but Markov, Subban and Plekanec all have ten. 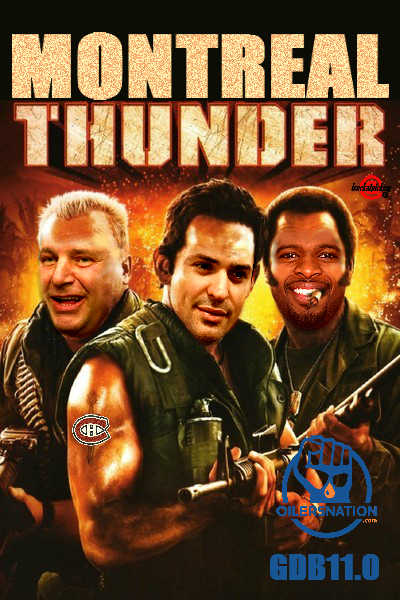 The Habs lead the NHL with 36 goals, while the Oilers are tied for 16th with 24. 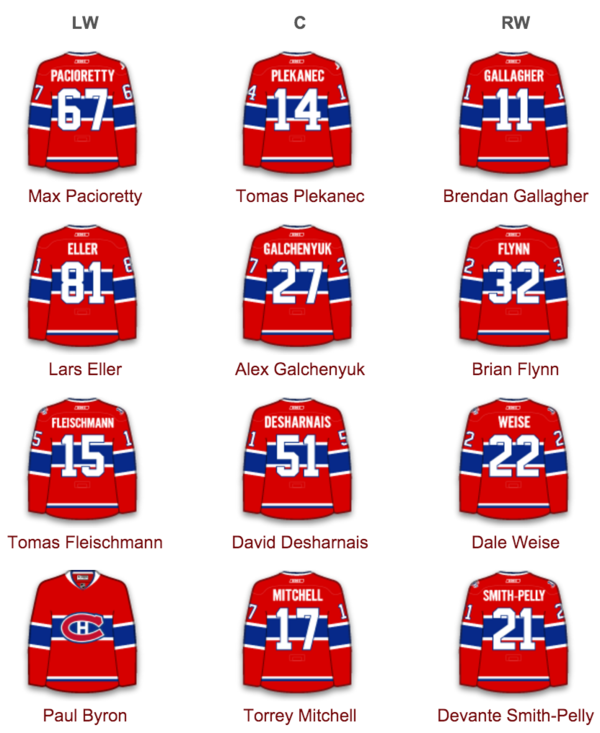 With only seven D-men, look for Hall and Pouliot to get extra shifts on the fourth line. McLellan hinted he might even spot McDavid in there. While away in the west, the Habs have also had some major moments. Max Pacioretty hit 30 goals for the first time in his career against theEdmonton Oilers; one year to the day that his C-4 vertebrae was fractured by Zdeno Chara. That same trip also featured the return of Andrei Markov after nearly two years out of hockey with two torn ACLs, and other various knee issues. His first night back was a magical game on Hockey Night in Canada, when he showed his love of PK Subban by leaping into his arms after the latter scored. While the western Canadian road trip has not necessarily been great for the Montreal Canadiens over the past five full seasons, it has also not been as bad for them as some would have you believe, and there’s really no reason to fear the trip anymore, at least not according to recent history. GAME DAY PREDICTION: For reasons unexplained the Oilers own Price. Oilers are desperate for a win, and surprise the Habs with a 4-2 victory. 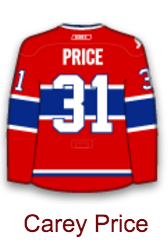 OBVIOUS GAME DAY PREDICTION: Petry will be mentioned more in the comments section and water cooler talk than Price. “Imagine our blueline with him instead of (fill in blank),” will be beaten to death today. NOT-SO-OBVIOUS GAME DAY PREDICTION: After an empty net goal secures the win, the fans rub it in a bit. In Montreal Habs fans love to sing the Ole (Oh- laaay), Ole (Oh lay), Ole (Oh lay), Ole (Oh lay) song. Oilers fans serenade them with their own version: Go awaaay, Go away, Go away, Go away…Go Awaaay! It will be an instant classic. I thought nurse looked great tonight! A great way to start the next 10 game segment. can we get 6 (or 7) of this 10? I noticed after the winning goal the sound people started playing some Dr Dre. Is this going to be the case now that we have the good Dr Drai playing with the team? For whatever reason the Oilers have Prices number, its baffling that Price cannot keep it together against the Oilers. But all in all a good gritty effort, nice comeback win and to do it against the most dangerous team in the league. Hopefully they can ride this wave for the next three games. Boy the mood on this thread sure whipsawed! All the negative nellies from pages 1,2 and 3 seem to have slunk away! Eberle is going to make things interesting. Dare we say… three scoring lines? That’s it! The Dare has been said erbady! I actually think it will be similar to Hall’s return last year when he was on the third line to keep things going. I could see that happening again. It makes me so happy that PK got burned by McDavid-Pouliot. It took until tonight to realize how much of a schmuck Subban is. Keep it rolling! Reaaaallly? C’mon dude, PK is one of the very best in the league. Makes it all that much more impressive that McDavid outmuscled and outraced him tonight. Nurse sure got a few good looks in the last 5 minutes of that game. Kid played some seriously tough minutes and shined. He’s a keeper. Drai looked great on the wing following after Hall and Nuge’s speed. I’m sure Eberle will take his spot but boy do the Oil have a solid top 6 emerging. McD, in my opinion, is in the top 10 for best players in the NHL. The kid made Subban look plain on the Pouliot goal. He’s creating something dangerous on nearly every shift….. he’s magical to watch. That. Was. AWESOME. You know what is more than awesome? Nurse will be a total beast within 2 years. McDavid will get only stronger and quicker. Hey, where are the Eichel fans that were on this sight? Better than McD? McD a bust? This kid is good!